"At any point, it is possible - and may be desirable - to step out of the prescribed step and begin an improvement trial using a Plan-do-check and act (PDCA) method. The worst that might happen is that the experiment may fail. If the trial is small scale, little harm would have been done, the need for a new change trial would have been identified, and learning would have been advanced." Describe the TQM implementation process. List the 10 steps of the TQM process as presented in this course. Describe five strategies for improving the problem definition. Explain how these three TQM tools are used: fishbone charts, flow charts and storyboards. Discuss the importance of using media to promote TQM initiatives. TQM is organized around specific problems within the organization. It is important to improve the central problems of an organization and not the most convenient ones. The problem has to be real, significant, and important to the majority of customers. Of course, any problem should be solved and any defect should be improved. But given the resources available, it is important to focus on the more important problems first. Assigning a team to a problem requires careful attention to the composition of the team. A multi-disciplinary team is needed so that team's decisions can be quickly implemented and tested. Management, nursing, physicians and other clinicians need to be involved. Defining the task of these interdisciplinary teams should be done carefully. Much can go wrong. I was a Branch Manager for a Home Health Care/Acute Care Staffing Agency that had been sold, then the former owners set-up an agency right down the street which was in direct competition. Business dropped off radically, particularly after there was flight from many of the top players to the new company. The new owners defined the problem as "What are they doing to take our business?" Their solution was to spend huge amount of time and money in legal haggles. A better definition would have been, "Why are our customers choosing other agencies?" or, "What in the marketplace has changed that our business is declining?" (Many hospitals began to set-up their own per diem pools instead of paying registry prices - and the new owners didn't focus on the whole picture.) We wasted too much time and effort. "Plunging in. Failing to gather sufficient information and jumping to conclusion about the nature of the problem. Frame blindness. Setting out to solve the wrong problem because you have created a mental framework for your decision, with little thought, that causes you to overlook the best options or lose sight of important objectives. Overconfidence in your judgment. Failing to collect key factual information because you are too sure of your assumptions and opinions. Short sighted short cuts. Relying inappropriately on rules of thumb such as implicitly trusting the most readily available information or anchoring too much on convenient facts. Shooting from your hip. Believing that you can keep straight all of the information that you have discovered. Fooling yourself. Failing to interpret the feedback you are receiving, either because you are protecting your ego or because you are tricked by hindsight. Group failure. Assuming that with many smart people involved, good choice will follow automatically, and therefore failing to mange the group decision making process. Not keeping track. Assuming that experience will make its lessons available automatically, and therefore failing to keep systematic records to track the results of your decisions." Given all that can go wrong with defining a problem it is important to take time and do it right. There is little data on what is the most effective method for problem definition. But some advice can be obtained from the research in this area. Define a problem without suggesting a solution. People often define the problem in a way that it strongly or actually suggests a solution. This prevents the team from searching all possible options. For example, one hospital was experiencing problems with patients failing to show for scheduled therapy sessions. If the problem is defined as delays in dispatching therapists, then other avenues for solving the problem (e.g., making sure the patient is in the room when therapy is needed.) may not be examined. Avoid suggesting any solutions, blaming anyone for the problem, or focusing attention on any profession. Define the problem in terms of the patient experience. Do not define the problem in terms of the process involved. Thus, "we are having a problem with crashes in our information system" is a poor definition. While, "patients wait too long for admission" is a better definition because it allows the exploration of other causes besides the information system. The solution, for example, may end up having paper admission forms. If you define the problem in terms of the customer's experience, you automatically remove embedded solutions to the problem. Here is another example: "The competition is driving us out of business." This seems like a good statement of the problem but it is not. It is not in terms of the customer's experience. Try: "Our customer's are choosing the competition over us. Define the problem in at least two different ways. A problem can be stated as "Few patients get admitted quickly." or as "Many patients wait long before admission." This may seem a mere play with words but it has much impact on the solutions generated. How you define the problem affects what ideas the team comes up with. The first problem statement focuses on the number of patients, the other focuses on long wait time. The solutions that come to mind may be different. Here is an example how subtle changes in a question can change the response. If you ask a person to tell you whether interest rates will be above 14 in the next year and then to estimate the rate. You get one answer. If you ask whether interest rates will be above 8 in the next year and to estimate the rate, you get an entirely different answer. Leading questions confuse everyone, even some of the most experienced people. This example shows how a subtle change in a question can lead to a major change in the response. 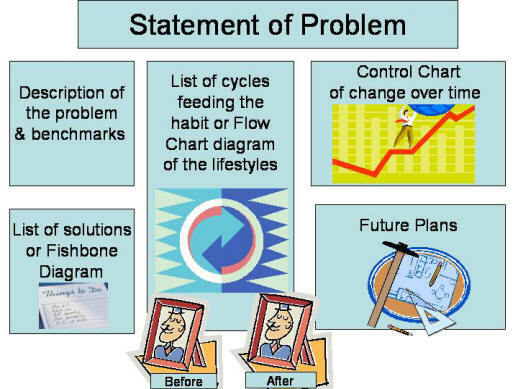 Likewise a subtle change in the problem statement can lead to examination of entirely new set of solutions. Do not blame anyone. State the problem in ways that do not blame any specific group or individual employees. Here is an example of a poorly defined problem because it blames a specific person: "The admission process did not work because the computer if often not working and the IT people are late in fixing it." This statement blames the IT department for why admission is not going more smoothly. This may be true but would force endless hours of frustrations and debate among the IT and other departments, each blaming why computers fail. Here is another poor example: "The problem in our clinic is that the doctor comes in too late." This statement is blaming the doctor for the situation in the clinic. This may be true but it is not a productive way of stating the problem because it makes the people who are blamed more defensive. An alternative way is to state the patient's experience and let the improvement team arrive at their own conclusions for why the problem is occurring. Rely on data. Define the problem and show the data for the problem. Show how much the data should change for the problem to be considered successfully addressed. Verify that the problem is real. Verify that the problem is important for the organization as a whole, i.e. it will affect the organization's survival, market share, income or expense. All problems should be solved, but more important ones should be solved first. Be specific. General statements could be best reserved for organizational goals or visions. Problems must be specific and attached to particular processes. A statement "Most of our beds are empty. We are having a low market share." is not a good problem definition as it (1) does not define the problem in terms of patient experiences, and (2) does not give enough details to focus our attention on a specific process in the organization. Compare this with "Ob-GYN patients choose another hospital for their second child and do not come back here." This is more specific and is put in terms of customer's experiences. State the problems in ways that is conducive to bring about rapid change to the problem. The above six criteria can guide you in this task. Teams are often told to engage in cycles of Plan, Do, Check and Act (PDCA). A key component in planning is to describe the current process. No problem can be solved unless it is understood. When poor outcomes occur, we need to understand the process that leads to it. This section describes two ways of understanding processes. The first is known as flow charting and lists events and how they lead to one another. The second is known as listing routines and lists events in the process sequentially as they occur. Both approaches document the process. Both are useful for communicating the team's understanding to others. Both create a shared understanding of the process among the team members. Often team members are surprised at how much more goes into a process besides what they knew. Flow charting is a visual step that when communicated through story boards reassures employees that the team has understood the process. Flow charting is time consuming. A lot more than people believe. Part of the problem is that processes are complicated and charting them takes time. Another part is that team members each have a different picture of the process and they need to exchange their views about the process. The literature on group effectiveness can be used to reduce the time it takes to create a process chart. Here are the steps for flow charting a process. Ask each team member to individually construct a flow chart of the process. The literature on group processes shows that when individuals work on ideas before bringing them to the group two things happen. First, ideas do not get to be evaluated prematurely as idea generation and evaluation are separated. Second, ideas are judged on their merit not based on who said what. Here are some guidelines about creating charts for individual team members. Use common notations. Show a step in the process as a box and show a decision in the process as a diamond. Break the chart into an overview and several details of specific processes. It is not possible to anticipate all possibilities. Keep the flow chart to 80-90% of events in the process. Chart what is the process and not what it should be or how it was supposed to be. Charting what the process should be introduces new areas of disagreement. The group facilitator takes the input from individual team members and builds one process chart that reflects all of the ideas presented using the terminology of the team members. If you do not have a group facilitator, you should ask each team member to put his ideas on stick-on pads and during the first part of the meeting attempt to arrive at a consensus on the process flow. The group facilitator presents the integrated charts as his/her poor attempt at constructing a flow chart and asks for revisions. The idea is to separate the idea from who generated it so that ideas will be judged based on their merits and not personalities involved. Also, data shows that group discussion at this time helps clarify many issues and in the absence of the group discussion the quality of the chart will suffer. Discuss parts of the chart. Move along from part to part till all segments are discussed. Do not force consensus. Accept that there may be genuine disagreements about what is the process. Post the chart to the story board. This makes sure that others can comment on the chart and correct obvious deficiencies. In addition, it will serve as a notice of things to come. It creates expectations. It helps prepare employees to be receptive to the recommendations of the team. Employees are more likely to accept a recommendation when they have a sense that the process was understood before solutions were proposed. An alternative to flow charting is to make lists of periodic events and work routines. Such lists are simpler to make but do not have a visual component. Despite this shortcoming, such lists may be just as useful in understanding a process. They are especially helpful in focusing the group's attention on repetitive tasks and work norms. Periodic lists are based on the principle that any system or process is best understood in terms of its “steady states;” that is in terms of events that keep recurring. Work is not a random heap of events. Some events reoccur and are referred to as routines. System Analysts refer to these reoccurring events as the “steady state” of the system. Systems are changed by changing the steady state of the system. By listing periodic events, a person can see the steady state for his or her work. The focus shifts from fringe or rare events to central and repetitive elements of a work process. The focus shifts to the small percent of activities that describe most of the observed outcomes. By listing periodic events, the work process and structure is revealed. There are many recurring events at work. Any given work process, starts with employees coming to work and ends with them leaving. In between patients arrive, information is exchanged, reports are made, meetings are kept, and numerous other activities are accomplished. The purpose of listing work routines to identify the key activities that occur within a process. The first step is to list the periodic events. It is not that non-routine events do not matter, they do; but the impact of routines events is by definition more frequent. If routine events can be understood, a big part of work process is understood. In order to list periodic events, the most useful tool is to follow a patient through the process and list discrete events that happen. Listing routines is easy because it lists events in the sequence they occur. In contrast flow charts list events in the way they influence each other, which may not be the sequence they occur. Identify work process. Label the process and define its boundaries. Check the depth of the list. It is not helpful to list very broad events (e.g. patients show, providers care for patients, patients leave) is a list of sorts but not very informative. Enough details should be present that could help understand what leads to process outcomes. Check accuracy of the list. The accuracy of the list is checked by carrying the list around and checking that events listed do occur and no other major event does occur. Another way of checking the accuracy of the list is to share it with others who have independently observed the event. "Learning from experience is not automatic. It requires profound skills. Experience, after all, provides only the data, not knowledge. It offers the raw ingredients for learning. And people can turn it into knowledge only when they know how to evaluate the data for what they really say. People do not learn as easily from experience as you might expect - even intelligent highly motivated people. ... Why don't people learn from their experience? For one, the data we receive can usually be interpreted in different ways. And even when the evidence is clear enough that we should learn from it, we are naturally biased to interpret it in a way that preserves our positive image. ... Because we like to believe that we caused successful outcomes and we like to rationalize that we were not responsible when things turned out badly, most people suffer from an attrition bias that can destroy useful feedback. In short we believe that our successes are due to skill and our failures due to bad luck. Data is needed to correct our experiences and insights. Data is also needed for communicating the problem and its solution to others. Without data there is no arbitrator among the various ideas. Different professions will claim solutions that in reality do not work to resolve the problem for the customer. In the end, data is the only way that different professions can become focused on the customer's experiences. Gathering data is time consuming. There are short cuts. One way is to sample. Sampling allows one to collect data from a sub-set of the customers and infer the experience of all customers. To sample effectively, you should choose the customers you survey randomly. Another way is to rely on experts' opinions. People often say that opinions are subjective and should not be relied upon. Is this reasonable? If by subjective we mean unreliable and idiosyncratic, then the answer is "No. Opinions can be more accurate than observations made by ourselves." When expert opinions are based on (1) their direct experience of the system, (2) shared across different experts, then opinions may be quite reliable. Sometimes, you just have to gather the data so that you can make your case for people outside the team. Many proposals fail to solve the problem at hand. It is important to gather data concerning how the intervention has solved the problem. Such data can be used to alert the team that a successful solution has been found. If the data does not show that the problem has been solved, the team needs to continue examining other solutions. Pilot testing and gathering data on improvement is also useful for helping other employees believe in the team's recommendations. Learning organizations need to allow for testing new ideas, even if these ideas are subsequently discarded. Without trying, that is without accepting that you will occasionally fail, no learning can occur. Teams should decide on the solution they wish to implement. One way to do so is through the Nominal group process. In this process team members silently generate a list of ideas. A group facilitator collects all ideas and lists it for all to see. Then group members rate each idea. The group facilitator collects the ratings and displays the average rating for each idea. Team members then discuss if certain ideas should receive higher ratings. Following the open discussion, team members rate again and the idea with highest ratings is selected. To see if the ideas select actually improve the situation, it is important to implement a pilot test of the idea and collect data on whether the change is an improvement. When data is collected, it is important to examine whether the process performance has changed over time. By examining the process over time, one examines the data before and after the intervention. One way to do so is through control charts. Control charts, especially risk adjusted control charts, are discussed in depth in subsequent lectures. Figure 2 shows an example of a control chart. In this chart data before and after the implementation of a change are displayed. The red lines show upper and lower control limits. Values that fall below or above the control limit signify a change in the process. Title of the project or statement of the problem. Include the project's name and list the team members. If the information is provided publicly, as it often is, avoid using contact information. Fishbone diagram or list of solutions. List possible solutions examined and mark the solutions implemented. Put your storyboard where you and others can see it on a daily basis. No point in telling a story if there is no one who sees it. Add sections as they become available. The idea is to generate a sense of anticipation and unfolding as the story is told. Organize the story well. Put time into keeping a chronicle of what happens to the patient and how their experience has improved. Write little and show more by pictures and drawings. Have fun in the design and content. Include some pictures of team members working together. Leave the story board up for several months even after the change has been adopted. Data shows that post-sales activities help improve adoption of innovations. A continued exposure to a story board will remind employees of the effort that was made and the success that was achieved. Allow for input from others. Let them write on the storyboard directly and modify it as they see fit. People like what they participate in creating. Make all of your slides before starting the narration. Do not use animation, it usually conflicts with narration on a machine that works at a different speed. Do not put too much text on slides. Do not use full sentences, abbreviate to key phrases. Once all slides are done, copy full-text sentences on top of your slides so that you can read your narration while looking at the slide. Delete the full-text sentences that you had copied on top of the slides. Distribute your narrated slides on the web, through email, or by other mediums. Many improvement projects fail to create a story board. Or if they do, they create the board only after the fact. This is a mistake and these projects are not taking advantage of an important communication tool. When you make the storyboard on the first day of the project, it begins to tell that something is up. As time goes on, it unfolds a story about what the team is up to. The climax of the story is reached when the control chart is posted showing the improvement. Story boards are the team's public minutes. It helps integrate the rest of the deliberations. Unfortunately, many are not comfortable with taking advantage of mass communication tools, like a storyboard. But real lasting change requires help from others who share the environment. Without the storyboard, others are not aware and cannot contribute to changes in the environment. When an improvement effort has succeeded in one unit of the organization, it is important to spread the improvement to other units. The key in accomplishing this step is to persuade other units to adopt the change by explaining the benefits of the change. But sometimes this is not enough. Some employees may not want to change no matter how much they will benefit from the change. It is important to work on barriers for widespread implementation of the change. Many projects make rational arguments, based on self interest or organization's interest (e.g. if we make this change we can save money). This is not enough. Adoption of improvements across organizations are more likely when the self-interest arguments are supplemented with emotional appeals. Employees are more likely to change when they are reminded about it, feel good about the change, see others that they admire changing and adopting the new ways, and think it will help them do their work with less effort. List the steps in TQM. These steps were presented under the lectures on "Leading change" and "PDCA cycle" combined. For the steps were specific tools have been suggested, list the tools. At a minimum list the following tools: problem definition criteria, control chart, storyboard, brainstorming, flow chart, Fish-bone diagram, and Nominal Group Process (which is a group processes for delaying evaluation of ideas). The purpose of this question is to help you see the big picture. Be brief but show me that you know each step and the principle tool used in it. Two aspect of TQM are often missing in improvement projects: (1) data on improvements made and their variation, (2) story board. Speculate why is the case. Why is it so difficult to do these steps? Does the omission of these two components matter? If you were running the TQM resource group, would you remedy this situation and how would you do it. Have you heard a poorly defined problem? A problem that does not fit the advice given in this lecture? State the problem you have heard. Please read the lecture and note the advice given about problem definition before you answer this question. Correct the statement given in response to question 3. List four criteria from the reading that can be used to evaluate problem statements, then revise the above statement to meet all four criteria. To help you get ready for a number of control chart assignments coming up later in the course, we ask that you become more proficient in using Excel. In cells A1, through A4 enter the following data: 25, 50, 75 and 100. Calculate the sum, count, standard deviation and average of the data. To accomplish this task you need to use the functions =sum, =count, =stddev and =average. Narrated lectures require use of Flash. This page is part of the course on Quality, the lecture on PDCA Cycles. It was last edited on 05/12/2003 by Farrokh Alemi, Ph.D. © Copyright protected.